Anyone know where this is? Added by Phil Brough. Cannigal, St Ola, Scapa Bay in the background? Dont ken whar hid is bit i dae ken oic planning staff could learn a lot if they studied this picture. No risk o flooding here - ither fae nature ur thir animals . is this cannigal farm above scapa? Ah thowt id might be somewhar 'roond Cannigal. Yes! 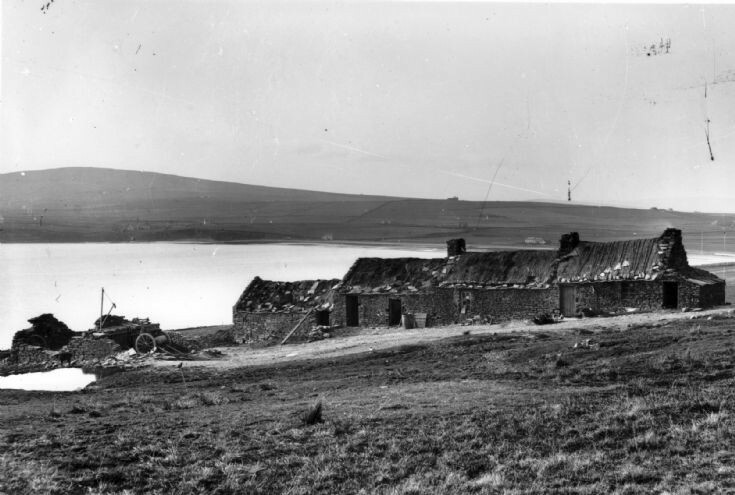 This is Cannigal Farm above Scapa. The upper end with the chimneys was the house,i n the middle the stable, and the lower end was the byre. The farm was the first to grow potatoes in Orkney, according to the story in an old Almanac pre 1700. A sailor off a ship anchored near Scapa was courting a girl from Cannigal and he gave her some potatoes which they knew nothing about. The story goes that they kept the potatos near the chimney over the winter and planted them in the Spring and obviously they grew. The old steading and house was used as a barn and storage, up to last year. Added by Phil Brough. but not the sort that young girls always wanted! !.